Driving clothing includes all those clothes that are worn while driving which protects the body during an accident. These protective clothing are expensive as most of them are chemically treated to tolerate the impact during a crash. Such clothing are mainly made of synthetic materials as they are lightweight and cheaper compared to other materials and hence more accepted in the market. The global driving clothing market is segmented based on product type, material type, end-user, vehicle type, distribution channel, and region. In terms of product type, jackets segment acquired the largest market share of approximately 43% in 2017 due to its widespread application across the globe. Jackets used while driving has now become a style statement apart from its basic usage and hence is more accepted across the globe. Additionally, these are cheaper compared to other clothing such as trousers and suits and hence are more affordable. 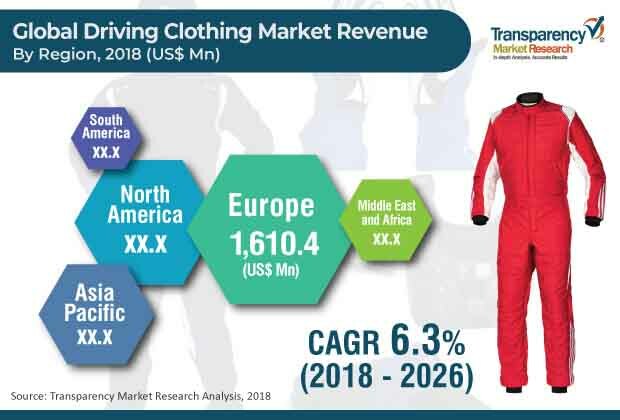 Geographically, the driving clothing market is segmented into North America, Europe, Asia Pacific, Middle East & Africa (MEA), and South America. Europe held the majority value share of approximately 33% in the global driving clothing market in 2017. The increasing popularity of motorsports as a spectator sport is creating demand for driving clothing. Additionally, enforcement of stringent safety regulations globally is creating additional demand for protective clothing. Increased personal awareness among individuals regarding safety due to increased road accidents globally is also helping in proliferating the demand for driving clothing. However, Asia Pacific region is anticipated to have the highest growth at a CAGR of 6.8% during the forecast period. Asia Pacific countries such as China, India, Australia and many other Southeast Asian countries are becoming the center stage for professional auto racing events as well as long haul rides with touring and adventure sports. Additionally, China being the manufacturing hub is gradually moving into the manufacturing of branded driving clothing. According to material type, synthetic material segment acquired highest share of approximately 60% in 2017 and is also expected to grow fastest during the forecast period at a CAGR of 5.9%. Synthetic materials are lightweight and affordable compared to other materials and hence are more accepted. Men’s segment under end-users acquired majority of the share and is further anticipated to expand at the highest rate during the forecast period with a CAGR 5.8%. Based on distribution channel, the offline segment held a major share of approximately 73% globally in 2017. Driving clothing are costly products as they provide protection during impact and hence consumers prefer to have the experience of feel and touch before purchase. Moreover, sales of counterfeit products through online channels have restrained consumers from approaching online modes. However, harmful impacts relating to recycling of auto racing suits and other protective clothing is one of the restraining factors for the growth of the driving clothing market. Racing suits are made of synthetic fibers such as polyurethane, nomax, and proban. Various other synthetic fibers are difficult to dispose and extensive chemical treatments are required for this purpose. Companies engaged in decomposing such materials require considerable funds for the process, thus slowing down the process. This results in dumping of the clothing without following proper guidelines. Increasing number of driving enthusiasts is boosting the demand for driving clothing. People across the globe are seeking adventure and freedom, and riding a superbike or a turbo charged car gives them a sense of both. Moreover, penetration of e-commerce sites has revolutionized the driving clothing market. E-commerce site such as Amazon, Alibaba and other company owned sites are increasing the geographical presence of prominent manufacturers. Some of the key players in the driving clothing market include PUMA SE, Adidas AG, Under Armor Inc., Alpinestars S.p.A., Dainese S.p.A., Fox Head, Inc., Scott Sports SA, ThorMX, OMP Racing S.P.A., 3D Industries etc. Key players operating in the driving clothing market adopt numerous strategies to sustain in the market. Product development and acquisition and partnership are some of the main strategies adopted by key players to gain a competitive edge.